International Space Station (ISS) crewmembers have conducted the second of three EVAs on Thursday, as they upgrade the station, perform routine maintenance, and prepare the station for the arrival of future commercial crew vehicles. 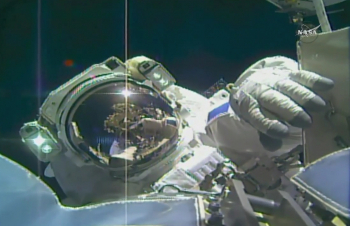 The second EVA got underway at 6:29 AM Central and concluded seven hours later. 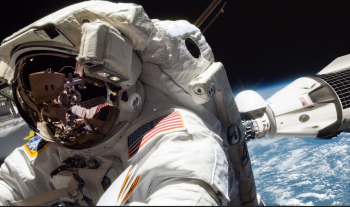 The trio of spacewalk operations began with US EVA-40, performed by NASA astronaut Shane Kimbrough as EV-1, and ESA astronaut Thomas Pesquet as EV-2. 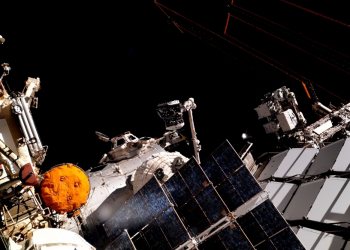 Kimbrough worked at the S0 Truss to swap out an External Multiplexer/Demultiplexer (EXT MDM) box with an upgraded unit known as an Enhanced Processor & Integrated Communications (EPIC) unit. MDMs perform multiplexing and demultiplexing functions, which essentially means that they send and receive multiple signals and data streams between the ground and the ISS, or ISS laptops and ISS systems, or ISS systems and other systems. This essentially allows all the ISS systems to talk to each other and be commanded by both the ground and the ISS crew. While it’s commonly referred to that the ISS crew use laptops to control the station, in fact the laptops control the MDMs, which in turn control the station. There are two types of MDMs on ISS – internal (INT) and External (EXT). EPIC upgrades have previously been performed on INT MDMs, where the units themselves were opened up and new, upgraded circuit cards were installed to upgrade the MDMs to EPIC standard. For the EXT MDMs however, this would be too fiddly to perform by EVA crewmembers, thus the entire MDM itself was swapped out for an upgraded unit. The EPIC upgrades equip the MDMs with faster processors, increased memory, and an Ethernet port for data output, which gives the ISS greater communications capability, allowing for the operation of more simultaneous experiments. The MDM swap-out procedure itself was fairly simple, with bolts first driven to remove the old unit, and the new unit then being bolted in its place, with a pre-positioned ethernet cable then being connected to the new MDM to take advantage of its upgraded capabilities. The removal and installation went to plan, via the use of Shane’s Pistol Grip Tool (PGT). 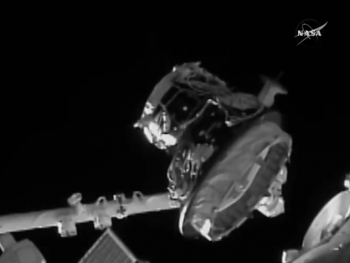 Following completion of the MDM task, Kimbrough then headed to Pressurised Mating Adapter-3 (PMA-3) on the Port side of the Node 3 module, whereupon he disconnected four heater cables between PMA-3 and Node 3. This was to prepare PMA-3 for its long-awaited relocation from Node 3 Port to Node 2 Zenith, so that it can serve as a docking port for future commercial crew vehicles. 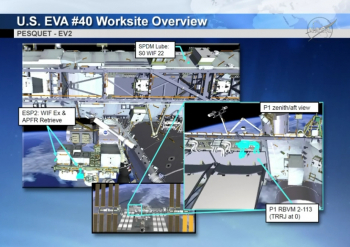 Between EVA-40 and EVA-41, robotic operations conducted the relocation of the PMA. In its old location on Node 3 Port, PMA-3 was unusable as a docking port due to clearance issues with the station structure. The last time that PMA-3 was actually used for a docking was during the STS-98 shuttle mission in February 2001, and since that time it has been shuffled around different ports on the ISS and used for storage. However, with commercial crew vehicles soon coming online, which will use the “direct handover” model for crew transfers, PMA-3 has now found a use once again as a second docking port for commercial crew vehicles. At one time a plan was under consideration to return PMA-3 to Earth on the final Space Shuttle flight, STS-135, in July 2011, as it was not envisaged at that time that PMA-3 would ever be used again, since the plan then was to build two Common Docking Adapters (CDAs), which were flat devices to convert ISS Common Berthing Mechanism (CBM) ports to commercial crew docking ports. However, it was subsequently decided to retain the PMAs as docking ports for commercial crew vehicles, rather than build a brand-new docking adapter, as the PMA’s tunnel-like design provides a good amount of spacing between visiting vehicles and the ISS, thus avoiding any clearance issues between vehicles and the station structure. With PMA-3 relocated to Node 2 Zenith by robotic means, it will need to have an International Docking Adapter (IDA) installed onto its end, in order to convert its Androgynous Peripheral Attachment System (APAS) compatible docking port to a Soft Impact Mating Attenuation Concept (SIMAC) compatible port for future crew vehicles. Once complete with the PMA-3 task, Kimbrough headed to the Japanese Exposed Facility (JEF) in order to remove & replace two failed camera/light units – once of which was located on the Japanese Experiment Module Remote Manipulator System (JEM RMS), and one of which was located on the JEF itself. Due to being ahead of the timeline, Shane then went to replace a light on a CETA (Crew Equipment and Translation Aid) Cart. Meanwhile, Pesquet headed to the External Stowage Platform-2 (ESP-2) in order to retrieve an Articulating Portable Foot Restraint (APFR) and extender, which he then installed on the P1 Truss as an anchor for himself while he performed his task – a visual inspection of the Radiator Beam Valve Module (RBVM) on the P1 Truss radiators. An RBVM is used to isolate and provide emergency venting of the radiator ammonia supply and return lines, and monitor temperatures and pressures in those lines. There are six RBVMs per each set of three radiators on the P1 and S1 Trusses. Over recent months, a small leak in the Loop B cooling system on the P1 Truss has increased in rate, although relatively speaking it is only by a tiny amount. To this end, NASA teams recently utilized a new piece of station hardware, known as the Robotic External Leak Locator (RELL), to try and find the source of the leak. As detailed in L2 notes from the time: “Ground teams performed a series of surveys using the RELL. These surveys were focused around RBVM P1-3-2 in an effort to help pin-point the location of a leak in External Active Thermal Control System (EATCS) Loop B”. As such, ground teams wanted Pesquet to conduct a visual inspection of the RBVM, and associated supply and return lines, in order to determine if any ammonia leak is visible, and if so, the precise source of the leak, although no action is planned to be taken at this time if a leak is found. Thomas was told to “pat and rub” the tubes, while filming the exercise on a GoPro camera, which will allow for detailed examination of the footage to see if any leaks can be observed. No obvious leaks were seen during the inspection. Following the RBVM inspection task, Pesquet then proceeded to lubricate the Latching End Effector (LEE) on the Special Purpose Dextrous Manipulator (SPDM) “Dextre”, which is a routine maintenance task for all LEEs on station, and involves applying grease to a ball screw inside the LEE itself in order to prevent any future metallic abrasion. On the end of a foot restraint, Thomas used a grease gun to apply lubricant to a rod, which he then inserted into Dextre’s ball screw joints, allowing for the lubrication of the hardware that had showed signs of wear and tear over recent months. 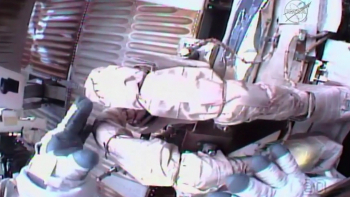 Following completion of the tasks, both Kimbrough and Pesquet headed back inside the airlock to conclude the EVA. Following the successful PMA-3 relocation from Node 3 Port to Node 2 Zenith on 26 March, EVA-41 got underway on 30 March, performed by NASA astronauts Shane Kimbrough and Peggy Whitson. The first order of business for Kimbrough upon egressing the airlock was to translate to the S0 Truss, in order to install the second EPIC EXT MDM, the first of which was installed during EVA-40. Whitson meanwhile headed out to the newly relocated PMA-3 on the Zenith side of Node 2, whereupon she connected two heater cables between Node 2 and PMA-3. The heaters prevent condensation from forming inside the module, which in turn will allow PMA-3 to be pressurized and ingressed. Whitson then removed a protective thermal/MMOD cover that had been placed over the top of PMA-3 during a previous EVA, in order to expose PMA-3’s APAS docking system, ready to receive the future IDA-3. 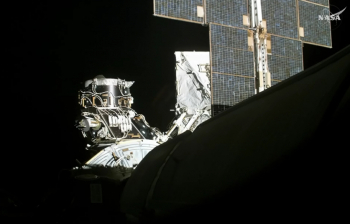 Both spacewalkers then met back at the airlock, whereupon they retrieved some shields that had been stowed outside during a previous EVA, and then both translated to the Port side of Node 3, which was previously home to PMA-3. 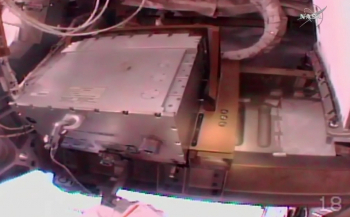 Once at the worksite, the pair worked to install four shields on the now exposed Node 3 Port CBM. All radial CBM ports feature four “petals” around the outside edge, which open/close as required in order to protect the hatch and berthing collar area from debris strikes. 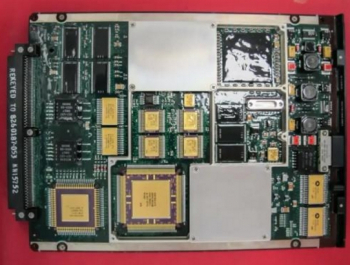 However, Node 3 Port is an axial CBM, which do not feature petals. For this reason, four petal-like shields need to be installed manually in order to provide protection to the exposed hatch area. The pair also closed the Center Disk Cover (CDC) Centerline Berthing Camera System (CBCS) flap, which will cover over the hatch porthole window to protect it from debris strikes. However, during the shield installation, one of the four quadrants liberated and floated away. There isn’t a spare on orbit, or one on the ground. Another will need to be manufactured and sent up on a future resupply mission. 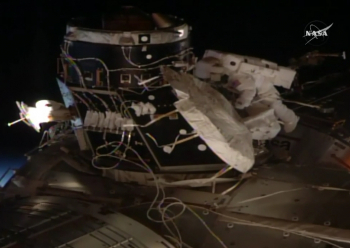 The duo then translated back to the airlock to retrieve more debris shields, whereupon translated out to PMA-3 once again in order to install two shields around the CBM berthing collar on the base of PMA-3. PMA-2 is berthed to Node 2 Forward, which is an axial port, featuring its own protective collar which protrudes from Node 2 itself to protect the PMA-2 CBM collar from debris strikes. However, since PMA-3 is berthed to Node 2 Zenith, which is a radial port, and so essentially is a flat surface berthed to a round module, the CBM collar’s sides are left exposed as the module curves away from them. For this reason, two shields were manually installed on the port and starboard sides of the PMA-3 CBM berthing collar, with two more to be installed on the forward and aft sides during EVA-42. This would provide protection to the PMA-3 CBM collar from debris strikes. With one shield missing, teams on the ground came up with a solution to replace the thermal cover over the PMA port to provide protection from MMOD. Classed as successful, the spacewalkers then worked the task of adding cummerbunds to the base of PMA-3. Once this task is complete, a get-ahead task of taking pictures of Node 2 were conducted, before both spacewalkers headed back to the airlock to conclude the EVA. This was the 199th spacewalk in support of space station assembly and maintenance. Kimbrough’s two spacewalks were the fifth and sixth of his career. Whitson was making the eighth and ninth spacewalks of her career – more than any other female astronaut. A third EVA is currently set to take place next Thursday.